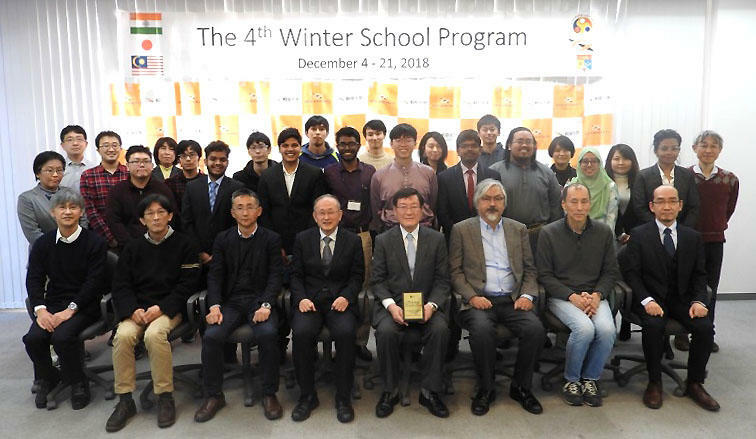 The 4th Winter School ended on December 21, 2018. A total of eight students from Indian Institute of Technology Guwahati (IITG, India) and the National University of Malaysia (UKM, Malaysia) attended the school. Students were engaged in wide-ranging activities prepared by Gifu University Head Office for Glocalization (GHOGL) for two weeks from December 4 to 21, 2018. They were: laboratory work, attendance of Japanese language classes, experiencing Japanese culture, and company tours. In their experiencing of Japanese culture, they visited Gujo City, Gifu Prefecture to observe local kabuki performance and also joined a Japanese drum beating practice session. In addition, students took part in Juni-Hitoe (layered kimono) Traditional Dress Workshop held at Gifu University on December 12. Everyone enjoyed moments to be exposed to the profundity of Japanese history and tradition.